Calling all most sweet-toothed members of the family! 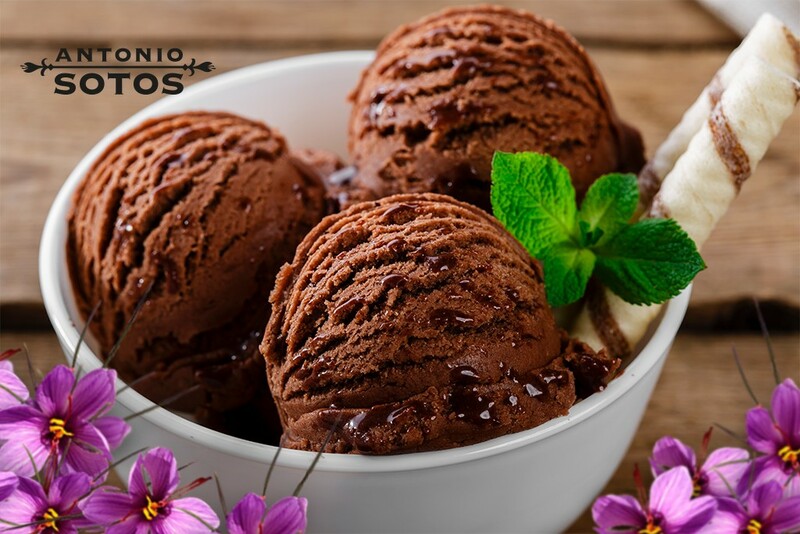 Today is National Chocolate Ice Cream Day and for making that something special and different at Antonio Sotos we have decided that there’s no better way for celebrating it than with a delicious homemade recipe as that of a saffron chocolate ice cream. Do you want to try something refreshing and yet sweet at the same time? Try our recipe! 100 g dark chocolate (to enhance the flavour it is recommended that the chocolate have a cocoa content of over 75%). 300 ml full cream milk. 300 ml cooking cream (must contain more than 35% fat). A few Antonio Sotos saffron strands. Over low heat in a saucepan add with the pieces of dark chocolate, 300 ml full cream milk and saffron strands so that the three ingredients are blended and completely dissolved. Once a perfect smooth mixture has been obtained, allow to cool. Beat the three egg yolks in a bowl until the yolks take on the whitish colour and inherent foamy characteristic and then add the previous mixture once it has cooled. When all the above ingredients are mixed, once again pour the ingredients in a saucepan heating over a very slow heat and stirring constantly until the mixture thickens. It’s very important that the contents of the saucepan do not boil, as the mixture would curdle which would entail starting the procedure from scratch. Once the mixture has a thick consistency, remove from heat and set aside to cool. Whisk the cream until stiff, either using a blender or by hand and add the thick chocolate mixture, after it has cooled down. Pour the entire mixture into a stainless steel bowl, cover and place into the freezer. How do I obtain the ice cream’s texture? Here’s the most important step so that the ice cream’s texture is perfect and pleasant on the palate. The mixture of all the ingredients must be beaten every once in a while so as to break up the crystals which are formed in the freezer, and therefore obtain a creamy texture. This process must be repeated 3 to 5 times during an hour until it is noticed that the texture is not crystallised. This ice cream will be a real delicacy for the palate, and also a few drops of chocolate or caramel syrup are added then that perfect touch for those most sweet-toothed members of your family can be obtained. Shall we cool down the week? Tell us how you’re going to sweeten National Chocolate Ice Cream Day on our Facebook, Instagram and Twitter social networks.